Looking to About Time, Ender's Game and Thor: The Dark World for inspiration, we've pulled together a selection of sci-fi romances, out of this world children's movies, and Marvel superhero stories. From Love Actually's writer-director Richard Curtis comes a story of a young time traveler who uses his incredible ability to go back into his own life to find love. Domhnall Gleeson, Rachel McAdams and Bill Nighy star; Curtis directs. Read our full review here. With About Time, Curtis uses science fiction to tell a truly unique love story. And if you like your romance with a slathering of sci-fi/fantasy, you'll go gaga for these rom-coms that offer heartsick heroines struggling with love, time travel, and mind-bending technology. 13 Going on 30 (2004) A gawky 13-year-old in 1987, Jenna wants nothing more than to be a grown-up. With the help of some wishing dust on her birthday, she wakes up to be a 30-year-old woman who is no closer to understanding life or love. Basically, it's Big but for girls. Jennifer Garner, Mark Ruffalo and Judy Greer star; Gary Winick directs. Safety Not Guaranteed (2012) Aubrey Plaza stars as a jaded young journalist who is researching a a man who thinks he can time travel. But once she actually meets this self-proclaimed time traveler (Mark Duplass), she begins to let go of her skepticism and trust her heart. Jake Johnson and Karan Soni co-star; Colin Trevorrow directs. TiMER (2009) This quirky and completely charming indie is set in a world where a special timer device installed in your wrist counts down to when you'll meet your perfect match. This dramatically effects the way relationships work, with some living it up until love comes along, and others fretting over how fast their fate is to be sealed. But Oona (Emma Caufield) is troubled by her timer's dedication to remaining blank. This conundrum gets all the more confusing when she meets a young man who she really connects with…but her timer remains unimpressed. So, she's forced to wonder if timers work or if they are just a self-fulfilling prophecy. John Patrick Amedori, Michelle Borth and Desmond Harrington co-star; Jac Schaeffer directs. In a world where the Earth has been assaulted by a bug-like alien race, The International Military seeks a child prodigy that can lead their space warships to victory. Could a self-assured yet compassionate boy named Ender be the savior the demanding Colonel Graf has been waiting for? Asa Butterfield, Harrison Ford, and Hailee Steinfeld star; Gavin Hood directs. Read our full review here. 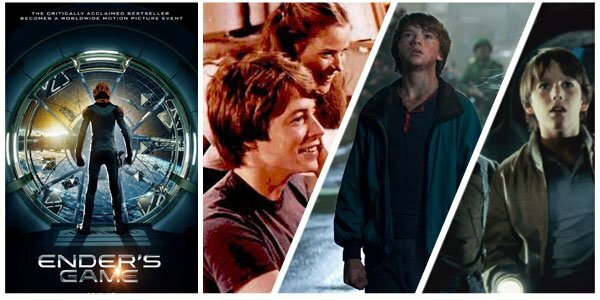 Few kid movies are as ambitious as Ender's Game, but quite a few feature similar sequences, be they kids mastering challenging technology, war games, or intergalactic diplomacy. The trio of titles below share Cold War inspirations with the novel on which Ender's Game is based, as well as some key plot points. WarGames (1983) Matthew Broderick stars as a brilliant high schooler whose skill for hacking taps him into a supercomputer at North American Aerospace Defense Command. He thinks he's playing a new video game about nuclear war, but little does he know he is escalating the Cold War tension between the US and Russia. Dabney Coleman and Ally Sheedy co-star; John Badham directs. Explorers (1985) Ethan Hawke stars as sci-fi obsessed whiz kid whose vivid dream inspires him to build a spacecraft of his own. With the help of his best friend Wolfgang (River Phoenix), Ben constructs a ship out of a Tilt-A-Whirl car and travel all the way to another galaxy. Joe Dante directs. Super 8 (2011) Inspired by the Amblin movies of the 1980s, writer-director J.J. Abrams created this thriller about six kids whose plans to make a monster movie lead them to discover an alien who has recently escaped military containment. While the town lives in fear of this unearthly creature, one boy overcomes his own terror, and tries to uncover the truth about this intimidating extraterrestrial. Joel Courtney, Kyle Chandler, and Elle Fanning co-star. When Asgard is threatened by a dark force that Thor and his father cannot beat back alone, he reaches out to his Earthling love Jane Foster and his shady brother Loki for help. Chris Hemsworth, Natalie Portman, and Tom Hiddleston star; Alan Taylor directs. Read our full review here. Revel in all things Thor with a DIY movie marathon about this brawny god from Asgard. Whether he's earning his way to his mighty hammer, battling his trickster brother, or assembling with the Avengers to fight off a massive force of alien invaders, his adventures are always wildly entertaining. 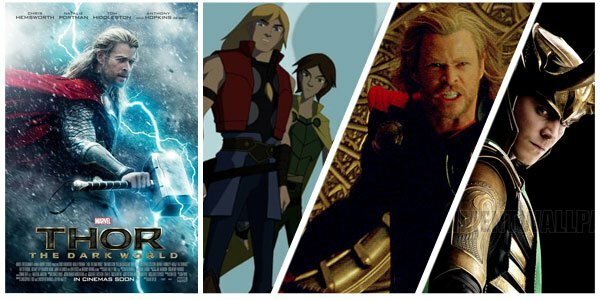 Thor: Tales of Asgard (2011) Focusing on Thor and Loki's boyhood, this animated adventure plays a prequel to Thor's first live-action feature. Here they aren't enemies, but the united Sons of Odin, seeking to prove their manhood by questing for a legendary sword. Matthew Wolf, Rick Gomez, Chris Britton and Tara Strong lend their voices; Sam Liu directs. Thor (2011) After proving impetuous and a disappointment to his father, Thor is cast out of Asgard and thrown to Earth. There he must recover his magical hammer Mjolnir and find redemption with the help of astrophysicist Dr. Jane Foster and her research team. Natalie Portman, and Tom Hiddleston star; Kenneth Branagh directs. The Avengers (2012) If you thought Loki's fall into the abyss off the Bifrost Bridge was the last you'd see of him, you underestimated the deceptive god. In this smash hit he returns with a vengeance as well as a devastating army, dedicated to bring the Earth to its knees. All that stands in his way is a band of fiercely independent heroes known as Thor, Iron Man, the Incredible Hulk, Hawkeye, The Black Widow and Captain America. Chris Hemsworth, Tom Hiddleston, Robert Downey Jr, Mark Ruffalo, Jeremy Renner, Scarlett Johansson, and Chris Evans star; Joss Whedon directs.